Transgenic marine medaka (Oryzias dancena) germlines were generated by the microinjection of the red fluorescent protein (RFP) reporter gene (rfp) driven by the endogenous choriogenin H gene (chgH) promoter. The selected transgenic lines contained multiple copies of the transgene (3–42 copies per cell) in their genomes. Although all the founders were mosaic, the transgene was stably transmitted from the F1 generation to all subsequent generations following a Mendelian pattern. 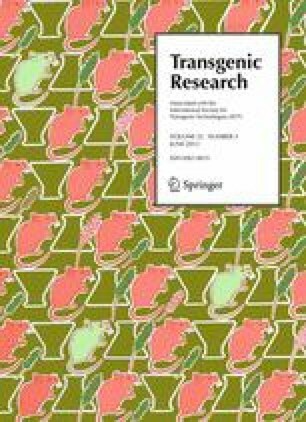 Different transgenic lines showed different responsiveness to estradiol-17β (E2) exposure at the mRNA and protein levels, and the expression efficiency was dependent upon the transgene copy number. The induction of RFP was significantly affected by the developmental stage of transgenic larvae: later-stage larvae (older than 7 days post-hatching) showed higher sensitivity to E2 exposure than earlier-stage larvae. The response of transgenic expression to E2 was fairly dependent upon the E2 dose (200–3,200 ng/L) and exposure period (1–7 days), according to both a microscopic examination of RFP intensity and a qRT–PCR assay. The transgenic marine medaka showed similar transgenic responses to E2 under freshwater, brackish, and seawater conditions. In addition to E2, the transgenic RFP signal was also successfully induced during 1-week exposure to various other natural (1 μg/L estrone and 10 μg/L estriol) and synthetic (xeno)estrogens (0.1 μg/L 17α-ethynylestradiol, 1 μg/L diethylstilbestrol, and 10 mg/L bisphenol A). The efficiency of transgene expression varied greatly among the chemicals tested. The results of this study suggest that the chgH–rfp transgenic marine medaka species will be useful in the in vivo detection of waterborne estrogens under a wide range of salinity conditions. This study was supported by a research grant from the Ministry of Land, Transport and Maritime Affairs, Korea (project #20088033-1).